The Birch Run Rotary Club is raising funds for a "Community Digital Sign". The sign will be in color, with a viewable area being 2'7" x 7'9" located in Gazebo Park at the corner of Main and Church Streets. It will be located on Village Property, with the intent of being used for Community Events announcements. It will be maintained and operated by the Village of Birch Run. The Village of Birch Run will do the installation and framing with materials that will match the Village of Birch Run. 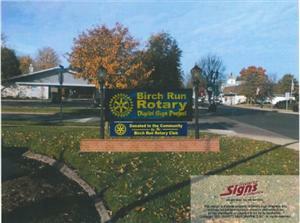 The sign will display the Rotary wheel with the words "Donated to the Community by the Birch Run Rotary Club". This project will enhance the visibility of the events in Birch Run, add to the quality of the community, and provide an opportunity for the community to pull together for a project. The funds needed for this project are projected at $35,000. The Rotary Club of Birch Run has 20% of those funds already committed and has a number of fund raising events that will add to those funds. We expect there will be some in kind work, grants, community fund raisers and donations that will make this project a reality and success.